CoCo Vandeweghe, Madison Keys, Venus Williams, Sloane Stephens: Half of the remaining players in the U.S. Open are Americans, and as the draw is set up, it could be an all-American semifinal on Thursday. You should root for Sloane Stephens. Vandeweghe, the 20-seed, got past No. 10 Agnieszka Radwanska, a relentless counter-puncher whom she had beat only once in six tries before this tournament, but she’s facing the No. 1 Karolina Pliskova in the quarterfinals, which will likely be the end of her U.S. Open run. She also once called Carmelo Anthony “soft” and generally has bad takes. No. 15 Keys knocked out No. 4 Elina Svitolina in three sets to book her spot in the quarters against Estonian qualifier Kaia Kanepi. Keys is a fine player, which is the most exciting thing you can say about her. Normally, this headline would read “Root For Venus Williams,” the seven-time Grand Slam crowd favorite who’s been playing some of her best tennis this year, reaching the Australian Open and Wimbledon finals before losing to her sister, Serena, and youngster Jelena Ostapenko, respectively. But in her quarterfinal tonight, she plays No. 13 Petra Kvitova, the two-time Wimbledon champion whose playing hand was slashed by an attacker in December, throwing her entire career into doubt. After undergoing surgery, Kvitova was able to return to competition more quickly than anyone expected, winning her first match back at the French Open. In this tournament—she has to pump her first with her right hand, because the repaired muscles in her left hand still can’t contract to make a fist—she hasn’t dropped a set. You can’t go wrong rooting for Kvitova, but if you want to throw your support behind a true underdog, look to the unseeded Sloane Stephens, who plays No. 16 Anastasija Sevastova today. Stephens, the world No. 83, underwent foot surgery earlier this year for a stress fracture, and in her first match back, she lost in straight sets at Wimbledon. She has a reputation for being blunt and spoiled—in an Elle profile from 2014, she infamously bragged about the size of her diamond earrings—but you could also read her as honest and unapologetic, especially compared to other players on tour. Stephens’s on-crourt presence in recent weeks has been scintillating. In the run-up to the U.S. Open, she reached the semifinals in Toronto, and in the second round of this tournament, she knocked out No. 11 Dominika Cibulková in three sets. Her ranking has catapulted 874 spots in less than a month. It’s the comeback story of the year and it’s not over. 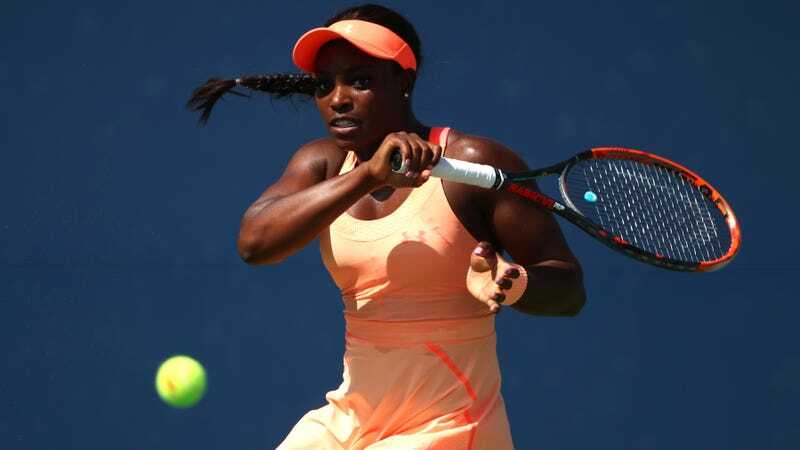 Can Anyone Think Of Another Reason Sloane Stephens Is Considered Serena Williams&apos;s "Protégé"?